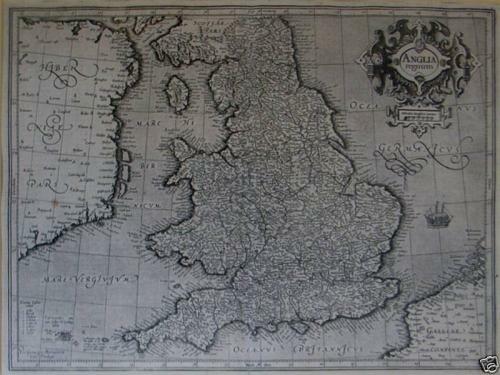 Title: 'Anglia Regnum', Duisburg 1595: a map of England from the Mercator's Atlas III. A finely engraved map of Elizabethan England filled with names taken from the Saxton map of 1579. Mercator has included much detail including a sailing ship, counties, towns, and natural features such as mountains, rivers, and lakes. Ireland's eastern coast, southern Scotland and north western France are also included. With a highly decorative strapwork title cartouche. A strong impression with wide margins. A small repair to the bottom centerfold. Very good condition.